Ahead of Rail Land, I took the opportunity to test out the Capital Connection train while travelling back and forth from my home base of Whanganui to Wellington and Christchurch to perform with Don Mcglashan. Retaining an urbanist philosophy in Whanganui is, as you might expect, a difficult prospect. The small city lost its last passenger service to Wellington in 1977, and while Intercity does run a few useful bus services each day, at reasonable (versus the price of gas), but not public transport prices, they don’t connect well to other public transport networks, and I find the rides long and hard going. To get to Wellington, I can take Intercity and get off at Waikanae - the start of Wellington Rail system, but the trip to Waikanae takes 3.5 hours due to a long break in Palmerston North, when the same journey takes only 1 hour 40 in a car. But the existence of The Capital Connection, just 53 minutes away in the transport hub of Palmerston North, makes good transport connections seem almost in grasp. The train runs from Palmerston North to Wellington in the early morning, and back in the evening, taking only 2 hours, 5 minutes. I’ve been wanting to take the service since I learned of its existence just this year (as I say, this is a secret train). So on a Thursday evening, I jumped aboard the Capital Connection at Wellington Station, just before 5:10pm. I wasn’t disappointed. The train is more spacious than I expected, with plenty of tables, power outlets and comfortable seats with leather headrests. A passenger told me the ex-British carriages are well past their use before date, and the ride is maybe a little more shakey than a Metlink carriage, but the relatively recent interior fit out is surprisingly - great. 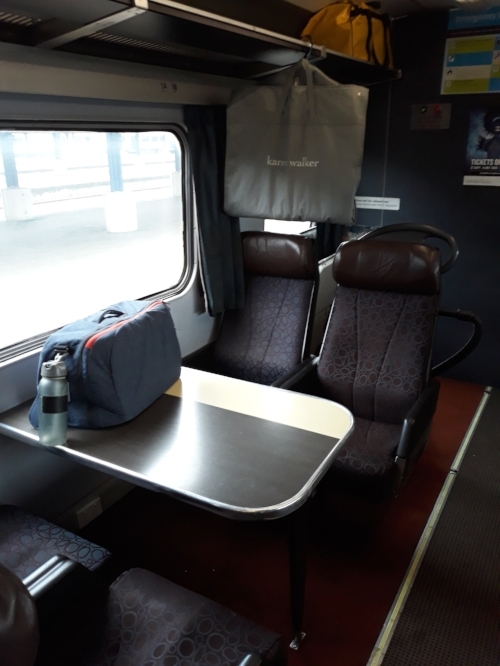 For legroom and comfort, It would beat any other passenger transport mode, and I even found the layout more comfortable than even Kiwirail’s Northern Explorer tourist train to Auckland, which has nice windows, but less legroom, and the nuisance of having to take an assigned seat. There is also a bathroom in each car, and, the luggage car accepted my guitar and pretty heavy suitcase without any hint of hesitation, or extra fees. Best of all is the cafe and bar. It serves real craft beer (Tuatara) in the evenings, and in the morning you can get two pieces of toast and a coffee for $5, delivered by a regular traveller with a long-time arrangement with Kiwirail. On a Thursday night there was a great atmosphere near the bar car. I sat at a table with a couple of bureaucrats getting off at, or close to Palmerston North, and a woman studying to be a pilot, who took this train to Paraparaumu because it was 10 minutes faster than the Metlink trains, and had a bar. A fantastic trip, even exceeding my expectations. Unfortunately there are no buses to or from Whanganui that can connect to this train, except, as I later learned, on Friday nights - when Intercity runs a late bus to New Plymouth that leaves Palmerston North at 7:45pm. This meant I had a chance to test the accomodation options in Palmerston North. So - I can now say, my recommendation, for the budget conscious traveller, is The Railway Hotel. In keeping with the secret theme of this show - the hotel is a sort of backpackers that doesn’t list on aggregators. It’s situated near where the train used to run, before Palmerston North moved it’s station to the far end of town. You can still see the bones of the historic turn-of-the-century railway hotel, despite some quite 90s decor touches. The New Railway Hotel offers 3 bunk dorm rooms for around 35 per person, and en suite rooms for 79. What sold me were the little things - plunger coffee in the ensuite rooms, and make-your-own toast in the morning, including the main selling point for me - Vogels bread. Of course, we expect many people at this show will be Palmerston North-based. With this in mind - we’ve devised a public transport loop using the Palmerston North - Levin Commuter bus, and linking to the Capital Connection. A few days later, I had the opportunity to catch a ride to Levin, in order to take the Capital Connection in the morning, connecting to a Wellington-Christchurch flight. For someone based in Whanganui, this is the most efficient route, because of the way State Highway 3 curves to avoid Palmerston North. Leaving Whanganui at 5.30 am and arriving in Levin around 6:42 left plenty of time to board the train at 6:53, and it also allowed for 20 minutes more sleep.